AMMONNEWS - Jordan and Iraq expect to bolster economic ties with a border industrial zone that promises 50,000 job opportunities and a host of projects to revitalise bilateral trade. The industrial zone is planned to reinforce economic cooperation in all fields with the help of private sector in both countries. It is also meant to facilitate exports of tax-exempted Jordanian goods to the Iraqi market and build mutually beneficial strategic projects. Jordanian King Abdullah II and Iraqi President Barham Salih last November agreed to expand cooperation in economy, trade, investment, energy and transport. This includes, in addition to the border zone, construction of an oil pipeline from Basra to Aqaba and rehabilitation of the Amman-Baghdad highway. Jordanian trucks have been unable to enter Iraq since 2014 because of security concerns. They instead unload their cargo at the Karameh-Turaibil border crossing, where Iraqi trucks then reload it. 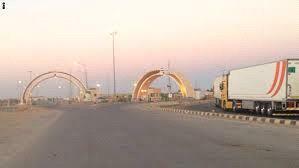 Approximately 80 Jordanian trucks laden with various commodities make this switch at the border crossing — the only trade route between Iraq and Jordan — every day. Prior to the border closure, more than 700 Jordanian trucks used to enter Iraq daily. Iraq and Jordan last August signed a security agreement on border protection, counterterrorism and intelligence capacity building. Jordanian exports to Iraq reached their highest in 2013, totalling $1.8 billion, but dived in 2017 to $542 million. “The zone will contribute positively in enhancing commercial exchange and reconstruction projects in Iraq, which is a positive sign and as we can see trade between the two countries had its great days and we hope that these days will return and be even better,” Dabbagh said. Loay Sehwail, chairman of the Jordan Industrial Estates Corporation (JIEC), the entity responsible for establishing, developing and managing industrial estates, said his team was ready to manage the new zone. “JIEC has the proper tools to manage the zone due to its long experience in this field. The zone will strengthen trade exchange and benefit from the various bilateral trade agreements,” he said. The zone topped the agenda of a high-level bilateral December meeting in Baghdad that also tackled regional railroad, customs exemptions on Jordanian exports to Iraq and linking the two countries’ power grids. Jordanian trader Ahmad Abu Khamseh said the industrial zone will boost business with Iraq as an alternative to the free trade agreement with Turkey, which was cancelled last year. “Turkey was a key market to Jordan because we used to import good quality commodities at affordable prices but the decision to stop the free trade agreement with Ankara and place a 15-30% customs fee on imports will make things worse for traders and consumers alike,” he said. Jordan terminated the agreement, purporting that Turkey did not transfer know-how to improve national industries as agreed to on in the deal. Abu Khamseh said the Iraqi market is huge and will have a positive effect on the development of Jordanian industries. The United Nations’ Comtrade database on international trade stated that Jordan’s exports to Iraq in 2017 were led by pharmaceutical products (16% of exports), followed by electrical and electronic equipment (13%), fertiliser (12%), plastics (11%) and soap, lubricants and waxes (10%). Paper and aluminium constituted the rest.